Across all three ties from the opening weekend of Six Nations action, the one prevailing theme was the importance of a good kicking game. Ireland's ability in this area is renowned and for good reason, with both Conor Murray and Johnny Sexton remarkably accurate from the boot. However, if Ireland were dominated in phase play and on the ground, they were conquered in the air. England kicked 32 times from hand. Similarly, Ireland's total ended at 31. But the difference in the efficiency of those kicks was profound. Conor Murray's box-kicks have been a particularly powerful platform, both as an outlet or for field position. 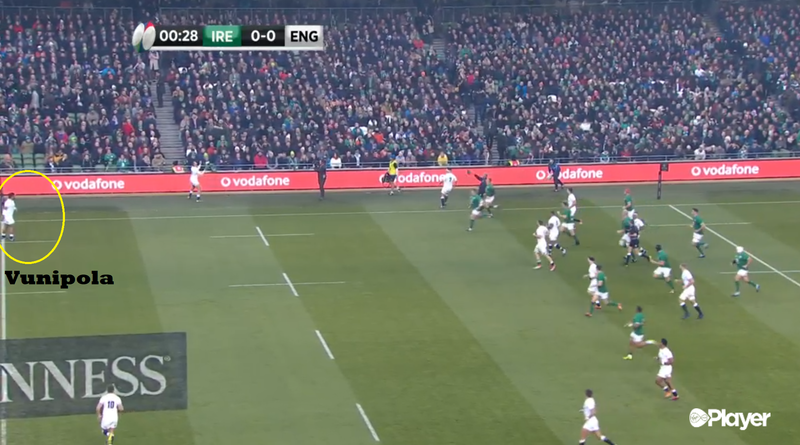 It's something that works in tandem with Ireland's overall gameplan; kick to the opposition and trust your runners to compete in the air or, failing that, your defensive line to force an error/turnover. There were three predominate things that undermined this approach. Kicking to Keith Earls' wing was an obvious ploy and had many advantages. It allowed Owen Farrell, a right-footed kicker, maximise his hangtime by kicking to the left. 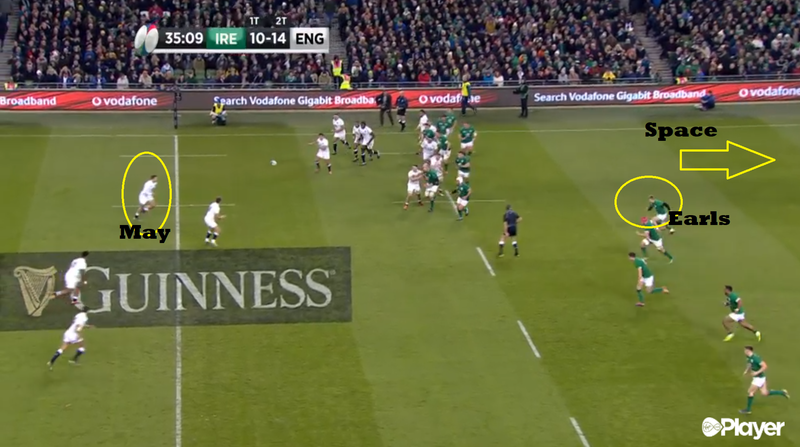 It also took out one of Joe Schmidt's best box-kick chasers. 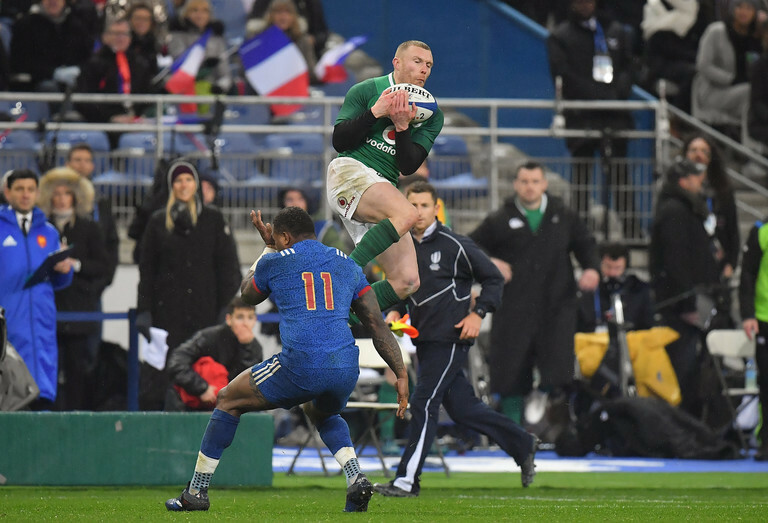 Earls speed and bravery in the air is something Ireland routinely utilise, with his last-minute catch against France last year a particular highlight. 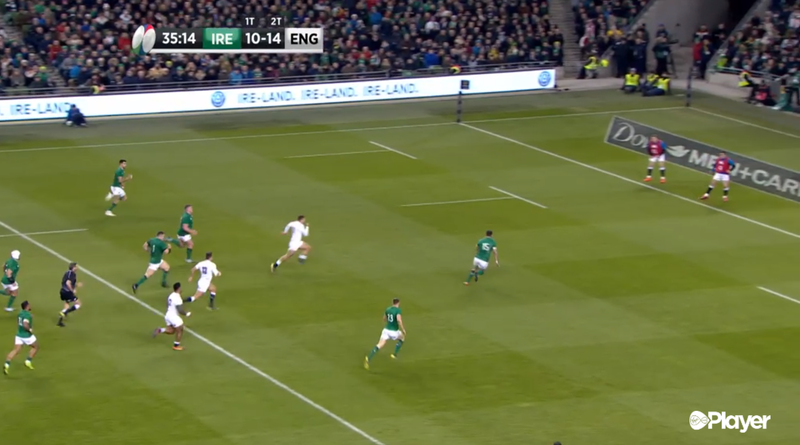 If Earls is occupied by receiving the ball he cannot compete off Murray's exit box-kick. 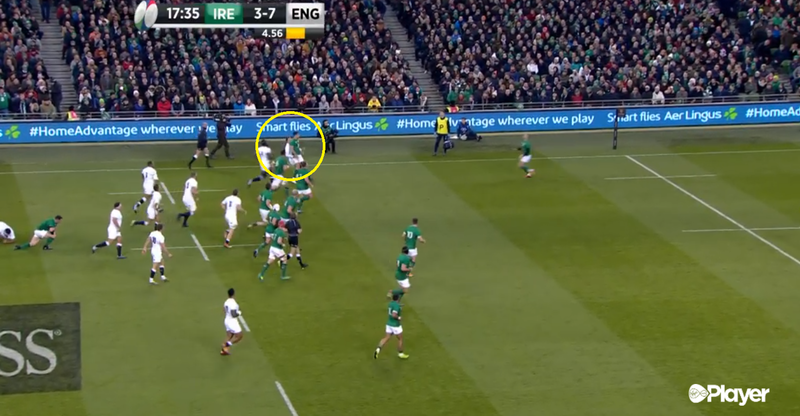 There was a superb strike play just before half-time that aided England's kicking game rather than inhibited Irelands, but it shows the level of homework their management ticket had lodged. Off a line-out, Jonny May came off his wing to stand alongside Farrell. In response, Keith Earls also came in field. From the next play, Farrell kicks into the space Earls has left behind and Robbie Henshaw very nearly got forced back over his try line. Interestingly, Conor Murray only kicked five times in the opening 25 minutes. Two were to touch or as an outlet, two were for field position and one was a kick in behind. Much had been made of England's decision to start Elliot Daly instead of Mike Brown but Eddie Jones ensured there was a disincentive to kicking the ball towards Daly, Billy Vunipola was standing right beside him. "I spent a lot of time in the backfield, so I got to watch it, I probably had the best seat in the stadium..." the number 8 said when speaking to the British press post-match. The result was that if Murray landed a kick in-field Vunipola would come firing back. It was evident from the very first effort. The Munster man went to touch with his kick because had he kicked deep, Vunipola would have carried back. From the resulting line-out, England launched their strike play that ended in a try after 90 seconds. 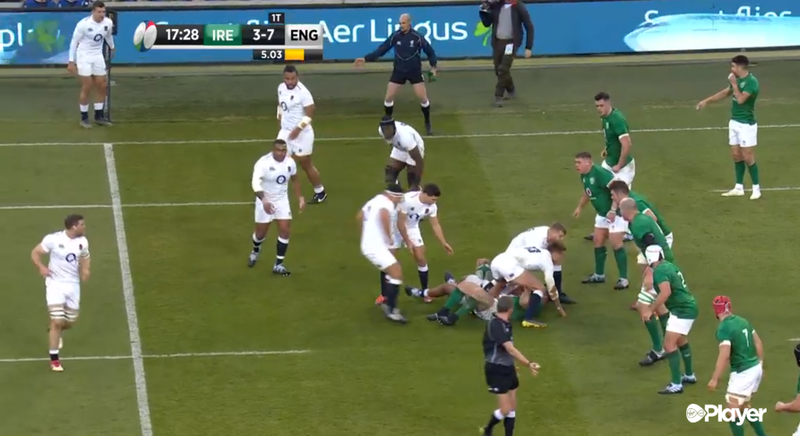 There was a revealing moment just after Mario Itoje hit Keith Earls off the ball. 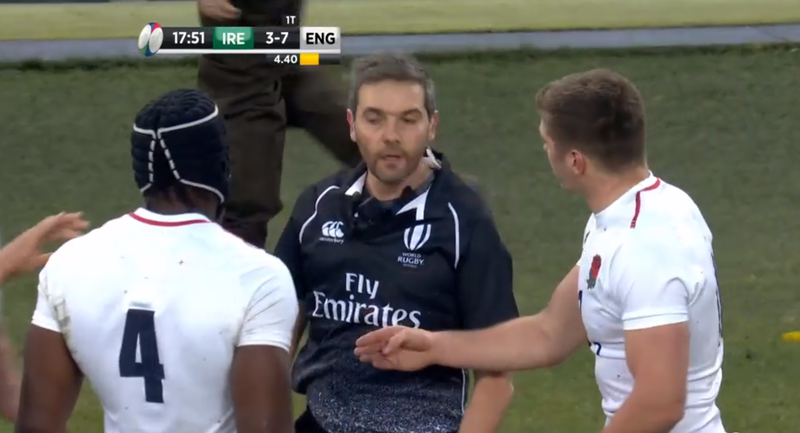 Owen Farrell audibly engaged referee Jerome Garces in a discussion picked up by the ref-mic. Farrell: Yesterday, we said about the blocking first? Referee: Yes, but he clearly charged the man without the ball. 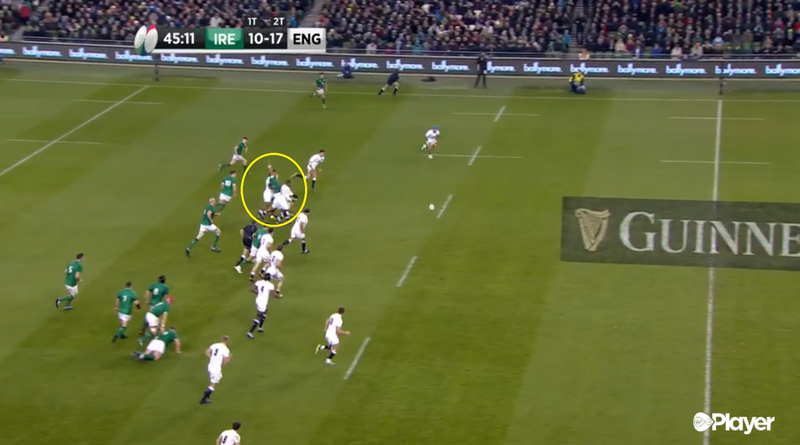 Farrell was referring to Conor Murray blocking Jonny May at the exact spot where the ball eventually landed. Jonny May is standing off-field shouting for the box-kick, Murray spots him. England clearly had done their homework on getting runners into chasers' channels on both sides of the ball. Evidently, it was something flagged with Garces before the game while Farrell himself choose shrewd lines to hinder Irish challengers in the air. Often times it was simply a case of maintaining lines, such as in the second half when Sexton chipped over the rush defence for Bundee Aki. Aki was obstructed but not illegally. An outfit that was determined but also well-drilled. England did not simply utilise their own specialities, they neutralised Irelands as well.